Nolo Assistant 1.1.18 Crashing in Win 10, installer is also not in 'English'. Crash screen is in Mandarin. Will try and attach. Hi yasslad, we thought the problem has been solved as you mentioned in Facebook. If it's not fixed, we would like to book a remote session for you. Please send us an email with your preferred time slot to our support team at support@nolovr.com. 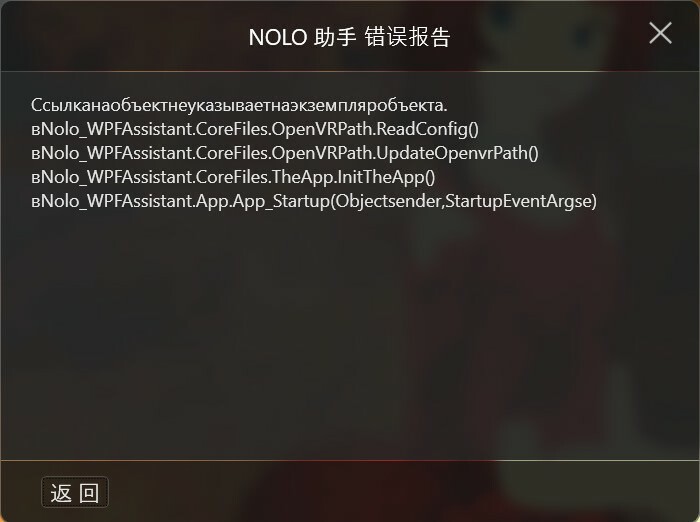 If I closing Steam then deleting file openvrpaths.vrpath, Nolo Assistant launching. After opening Steam file openvrpaths.vrpath recreates and Nolo Assistant not launching anymore. For some reason this line did not fill automatically after installing latest Nolo Assistant. Thanks, Shii. We will try to fix this bug in the next version. Not sure how, but after un-install/re-install the crash has gone away. Have the controllers working with SteamVR and HDK2 on the 1.1.18 release now. Some calibration issues still (controllers appear under/on-top-off user) but should be able to figure that out. Hi yasslad, thanks for your update. Can you try to calibrate the height and orientation to solve the calibration issues which you mentioned? Calibration is still an issue. Controllers appear in the right place in the Nolo Assistant viewer, but in SteamVR they are under my feet, or behind me. This must be an issue with the openvr driver that Steam is using, not an issue with the NOLO software/controllers. Is Nolo planning to release their own 'Steam VR' device profile? Capacity to calibrate within Steam would be great. @yasslad Thanks for your update. Can you calibration height or orientation by place headset marker on the floor and press pair button / facing base station and double click system button on the controllers? If possible, could you please record a short video and send it to our support team at support@nolovr.com? I have the same problem. Just a question: when I place the headset on the floor, controllers have to stay on the floor too? @aleasc Hi, you don't need to place your controllers on the floor with the headset marker. When you want to do the height calibration, place only the headset marker on the floor and press the pair button once will complete the calibration. @aleasc Thanks for your reply. We tested our devices with Riftcat but didn't encounter this issue. So we are still checking it now.